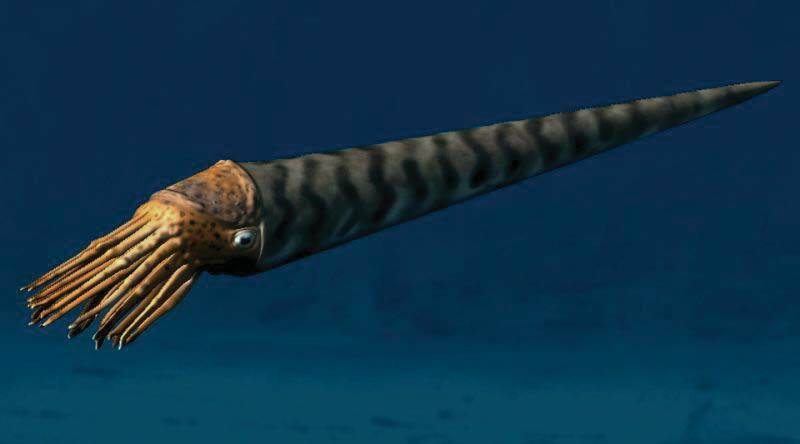 Figure 1: Artist’s reconstruction of Orthoceras. 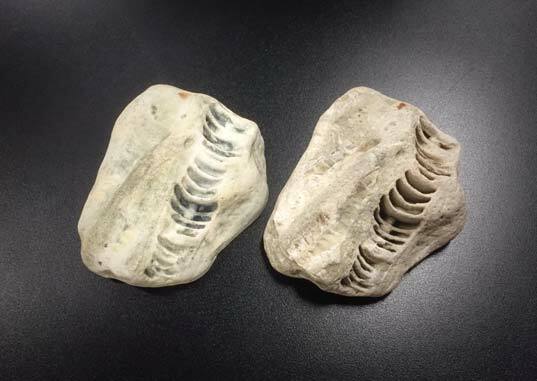 In April 2016, Stephen Vickers, a 3D Survey Specialist with EllisDon Virtual Construction Services, came to Objex Unlimited with the challenge of reproducing fossils he found locally along the Etobicoke Creek in Toronto, Ontario. 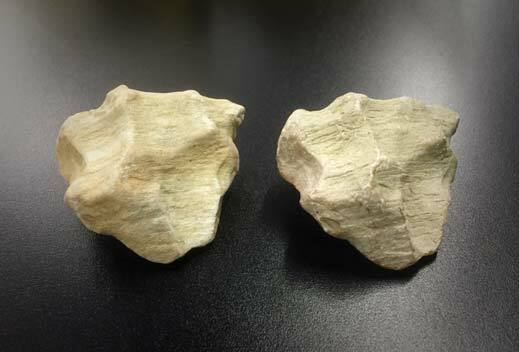 The area had been undergoing erosion control and had strong, varying currents and water levels, which may have led to the discovery of the fossils. The fossils being reproduced include three Conical Nautiloids Orthoceras, a straight cephalopod, and one unknown tooth or bone. The Orthoceras Cephalopod is a long-lost ancestor of the modern day squid and octopus that lived between 250 and 480 million years ago. Orthoceras means “straight horn”, and refers to its elongated long straight shell (Figure 1). The fossils vary in colour but all have the similar long tubular indentations (Figure 2). 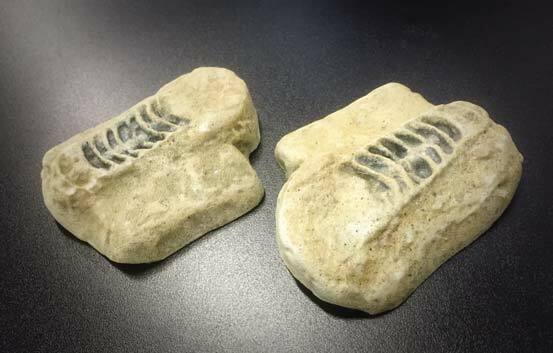 These types of fossils have been found across the world indicating this marine cephalopod was plentiful and thriving for some time. The other fossil, of unknown origin, resembles some sort of tooth or bone (Figure 3). The fossils were scanned by the company EllisDon, a construction company that offers virtual design and construction, using a FARO ScanArm®. This type of scanner differs from those used for typical object scanning, such as other handheld mobile scanners, like the Artec Spider or Eva. The ScanArm is a metrology probe with non-contact laser scanning sensor that provides high-precision 3D measurement and imaging used in a variety of industries. The scans were modelled using open source software MeshLab for surface reconstruction. Each scan was completed in under an hour by Vickers himself at low resolution for a speedy demo at the EllisDon office. Although the scanning was minimal, they captured enough data to create identical replicas of the face, and most sides of each fossil. Despite using state of the art scanners, EllisDon did not have their own 3D printer and found that those offered for use through public libraries were limited in their technological abilities. They brought this problem to Objex Unlimited in the hopes that the scans could be reproduced and 3D printed. belong to a Conical Nautiloid Orthoceras. (right) and the replica created at Objex Unlimited (left). The 3D models were printed on a 3D Systems ProJet® 660Pro ColourJet printer using VisiJet® PXL™, a sandstone-based powder. The ProJet®660Pro is a professional full-colour printer, however due to the composition of the fossils they were printed in white and hand-painted in order to capture the beautiful organic colours exhibited by the naturally occurring aggregates. One of the biggest challenges when reproducing fossils, or similar stone artifacts, is the variety of colours and textures present on one surface. Although the printers can achieve high quality color variations, they have yet to reach the perfection of precise colour variation that can be reached with hand painting. 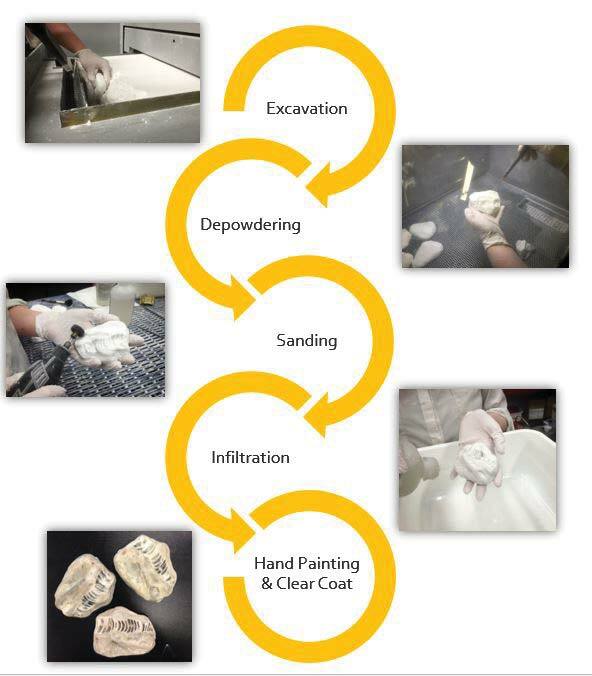 Once removed from the print bed, the fossils go through a standard post-processing procedure that is typical for sandstone prints (figure 4). The object is first sanded using various tools, and depending on the texture of the object, additional sanding is often required. For these objects in particular, minimal sanding was ideal as not to remove the delicate and detailed surface textures. Next, the infiltration process occurs, ensuring each fossil is coated with cyanoacrylate, a type of glue, which strengthens the models. To add additional strength to the models for frequent handling, an additional coating of B-72 was applied. Paraloid B-72, a thermoplastic resin, has been used successfully for significant increase in strength for sandstone parts, it also acts as a protective barrier for the raw model decreasing the risk of damage from water and oils from handling. In this particular case, once the objects were fully infiltrated, the painting process began: using oil paints, the models were hand painted over several days. The art of painting fossils and rocks is working with washes and layers, which can be a very long process since each coat of paint should dry fully before moving on to the next one. A variety of colours were used including reds, greens, and browns. Fine details and speckling were part of the final touches followed by a clear coat. When creating models that will be handled frequently, a clear coat is absolutely essential in order to protect the model itself and keep the paint finish. 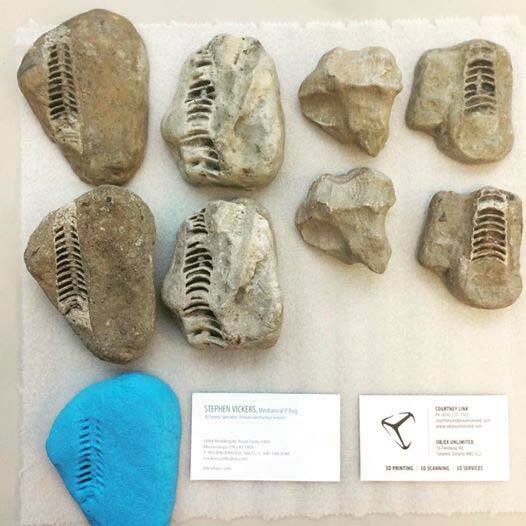 Creating replicas of fossils or other artifacts within private and museum collections is beneficial for both the institution and the visitors. By providing replicas as part of displays or programming activities, visitors are able to physically handle objects, creating a more immersive and engaging environment. In the past hands-off policies have been strictly enforced in museums and similar institutions. Recently, there has been a trend towards increasing more hands-on activities; this past year the MET allowed visitors to touch some of the world’s most famous paintings in an attempt to increase attendance and visitor engagement. What many people don’t know is that even natural oils from human hands can cause damage to some artifacts, no matter how gentle the handling is. When reproductions are used, not only can guests handle an array of objects freely, but the originals are at no risk of deterioration. With increasing interest in accessibility, especially in Ontario with the Accessibility Act, these sorts of objects are extremely useful for aiding individuals with disabilities, such as blindness, in having equal opportunity to enjoy exhibits and participate in programming activities. Vickers is one of many professionals in this field seeking to engage the community on a whole new level. As many cultural professionals have begun to embrace the possibilities of 3D scanning and printing, it is evident that creating a more interactive space in our institutions is important. With models that can be handled visitors connect with the content and physical objects on a new level, not only are we being engaged visually, but now tactilely. One of the replicas (left) and original fossil (right). Traditionally, museum objects, similar to the fossils, have been reproduced using molding and casting techniques, which can be invasive with the potential to cause damage to the items (figure 5). The first step of the process involves applying a removable protective coating. The artifact is then set up in plasticine and the mold is created over several days. Generally, silicone molds are made with a more rigid mother mold, often fiberglass or plaster. The replica is then cast using a resin or the desired finished material, depending on the object being reproduced, and the artifact must be cleaned following the mold-making process. The entire process can take up to a week or longer depending on the complexity of the artifact. Sometimes if an object is abstract in form, the casting process can take several attempts in order to produce a lifelike replica without imperfections. By utilizing 3D scanning, the entire process of artifact reproduction becomes easier and less invasive. By minimizing the handling of the object, conservators diminish the risks to the artifact and greatly reduce time spent waiting on the molding materials to cure. In addition, 3D scanning and printing is more cost-effective; the process saves both time and money, as demonstrated in Table 1. 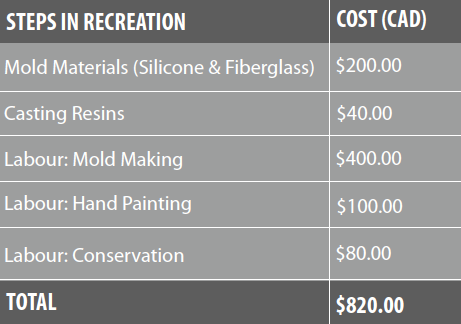 The costs for reproductions created using traditional molding and casting are based on a Junior Conservator’s fees as of December 2015. Costs include the reproduction of the 3 small sized fossils. A side by side comparison of the accuracy of using 3D technologies and hand painting. Each of the fossil replicas was completed successfully with the data provided. In the future, a high-resolution scan of all sides of the object would be beneficial in order to recreate the entire object. 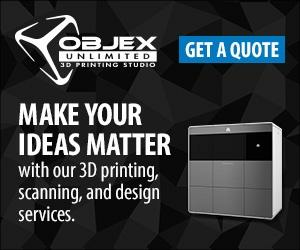 At Objex Unlimited, we have had great success scanning a variety of objects, big and small, using the Artec Eva and Artec Spider scanners offered by OEM Artec 3D. If we think back to how our reproduction process began, the scanning process, the opportunities for safe guarding collections and rare objects go beyond reproductions. Many institutions have begun to incorporate 3D scanning as a conservation and collections management tool. The scans can be used to track deterioration, document the object themselves, not to mention open up the collection to the masses by implementing digital databases. The fossils, and replicas, part of Vickers private collection were on display at the 2016 Ontario Heritage Conference in Stratford, Ontario from May 12-14. The 3D scans of the fossils, among other objects, can be accessed online through Vickers’ Sketchfab (svickers).